The science of chocolate | Why do people like chocolate? Photo: Yum chocolate. Now if you'll just excuse me, I have an appointment with my electric toothbrush. Chocolate is a food derived from the beans of the tropical cacao tree (Theobroma cacao), much of it grown in western Africa where high temperatures and rainfall provide perfect growing conditions. The chocolate you eat is produced from cacao beans in a multi-stage process. After harvesting, the beans are allowed to ferment, then dried, cleaned, and ground to produce a paste. This is then pressurized to form two ingredients known as chocolate liquor (also referred to as "cocoa liqor" or "cacao liqor") and cocoa butter. Different types of what we call chocolate are made by blending the liquor and the butter in varying proportions. The finest dark (plain) chocolate is made with at least 70 per cent cacao liquor and butter, while milk chocolate is made with only 50 per cent. White chocolate is make from cocoa butter without added cacao liquor. Why do people like chocolate so much? "For a dose of phenylethylamine, he prescribed himself a dozen ounces of chocolate. Recently it had helped lift the cloak of winter evenings." According to a recent study by psychologist David Lewis, letting chocolate dissolve slowly in your mouth produces as big an increase in brain activity and heart rate as a passionate kiss—but the effects of the chocolate last four times longer! Trust science to tell us things we already know! Actually, scientists have been trying to understand the chemistry of chocolate for years. Although there are several hundred different chemicals in your typical slab, a handful of them seem to be more important than others in making chocolate taste so good. Among the most important are stimulants including theobromine, phenylethylamine, and caffeine (in very small amounts). Researchers at the Neurosciences Institute in San Diego, California say chocolate also contains a feel-good chemical called anandamide, which is found naturally in the brain, and is similar to another one called anandamide THC (tetrahydrocannabinol) found in marijuana. Normally anandamide is broken down quite quickly after it is produced, but the San Diego chemists think the anandamide in chocolate makes the natural anandamide in our brain persist for longer—in other words, giving us a longer-lasting "chocolate high." So while chocolate does not contain the same active chemicals as marijuana, there is some similarity in the effect that both substances have on our brains. Photo: Chocolate break? 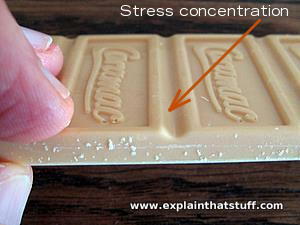 Chocolate and candy bars are usually molded so they have marks along their length where you're supposed to break them. But how exactly how does this help? When you apply a force to either end, it sets up stress throughout the bar. The stress runs in parallel lines down the whole length of the bar but the molded ridges mean the stress is concentrated there—just as it would concentrate around an accidental crack. The bar breaks naturally at these points just as a block of wood would break if it were cracked in the same place and flexed the same way. Maybe you love chocolate and I hate it— or I love it and you hate it. Either way, what makes us so different? When the two of us peel the wrapper off a chocolate bar and slide it in our mouths, do different thoughts run through our minds? Indeed, do our minds behave in completely different ways? Those are the sorts of questions neuroscientists have been trying to answer with fMRI (functional magnetic resonance imaging) brain scanning. It sounds complex, but the idea is simple: load your victim inside the scanner (with or without chocolate in their mouth), scan their brain, and see which brain bits "light up" in response. Can you see a difference between the brain scans of choc lovers and others? Photo: A typical MRI scan. 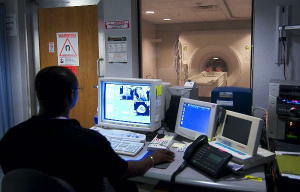 You can see the patient disappearing into the scanner (the white tunnel in the background) while a medical technician views the results on a computer screen in the foreground. Photo by Seth Rossman courtesy of US Navy. Oxford University psychologists Edmund Rolls and Ciara McCabe tried this in 2007 in an attempt to understand whether people (like me) who crave chocolate show a different brain response to those who don't. They found significant differences between choc-o-holics and non-choc-o-holics in three key areas of the brain known as the orbitofrontal cortex, the ventral striatum and the pregenual cingulate cortex. From previous research, these areas of the brain are known to be involved in other forms of addictive behavior, such as drug-taking, drinking, and gambling. Interestingly, Rolls and McCabe found differences using either pictures of chocolate or chocolate placed in a subject's mouth—so even looking at chocolate is enough to set off your craving. Not that choc-o-holics need scientists to tell them that, but it's something worth remembering: if you're dieting, and trying to cut out the choc, avoiding the sight of the forbidden food may be just as important as avoiding the nibbling of it. Enhanced affective brain representations of chocolate in cravers vs. non-cravers. Edmund T. Rolls and Ciara McCabe. European Journal of Neuroscience, Vol. 26, pp. 1067–1076, 2007. So is chocolate good or bad for you? Everyone's heard dentists say "Don't eat too much chocolate! ", but the chocolate itself is harmless to your teeth: the problem comes from the sugar in chocolate products. It makes a sticky substance called plaque, which feeds the bacteria that cause tooth decay and gum disease. Other health effects of eating chocolate remain unclear. Some studies suggest moderate amounts of chocolate can help to lower blood pressure, while others point to the high levels of saturated fats in chocolate products, which increase blood cholesterol and raise your risk of heart disease. To complicate things further, chocolate also contains high levels of antioxidant chemicals called phenolics (found in red wine and tea), which prevent fats from causing a build-up of cholesterol. A 1998 study of 7841 Harvard graduates by Dr I-Min Lee that found people who eat chocolate live longer than people who abstain, possibly because of the antioxidants: "... we estimated that (after adjustment for age and cigarette smoking) candy consumers enjoyed, on average, 0.92 (0.04 to 1.80) added years of life, up to age 95, compared with non-consumers." There's also anecdotal evidence that chocoholics live longer. Jeanne Calment (1875–1997) ate about a kilogram (two pounds) of chocolate per week and lived to the age of 122 (but she also rode a bike, smoked, and put olive oil on her skin, so no-one knows exactly what her secret was). It's important to remember the difference between stories like that and evidence-based science. While we can generalize about "chocolate," we should also bear in mind that the three main kinds of chocolate—dark/plain, milk, and white—are chemically quite different, which means they're likely to effect our bodies and brains in different ways. Dark chocolate's higher levels of cocoa give it higher levels of a chemical called epicatechin, which has been the subject of numerous recent scientific studies. In 2016, The New York Times reported on an experiment that appeared to show cyclists gained a slight but significant performance benefit by eating small amounts of dark chocolate (compared to control subjects who nibbled white chocolate instead). Two other interesting 2016 studies appeared to show benefical effects of eating dark chocolate for patients recovering from heart failure and enhanced memory formation ( though the subjects in the second experiment were snails!). How about the claim that chocolate can lower your blood pressure? There's some fascinating recent research into this, including studies of native cultures where low blood pressure seems to correlate with diets high in cocoa. In 2006, McCullough et al reported on a study of the Kuna Indians of Panama, who don't suffer the blood pressure and cardiovascular problems so common in the urbanized west, speculating that their "notably higher intake of flavanol-rich cocoa" could be significant. If chocolate were the cure for high blood pressure, an awful lot of people would be very happy indeed—and shares in chocolate firms would be soaring. Unfortunately, a 2016 study of 13 systematic reviews "provided strong evidence that dark chocolate did not reduce blood pressure," though it also found strong evidence "cocoa products with around 100 mg epicatechin can reliably increase FMD [flow-mediated vasodilation—dilation of blood vessels to increase flow], and that cocoa flavanol [the nutrients in cocoa such as epicatechin] doses of around 900 mg or above may decrease blood pressure in specific individuals and/or if consumed over longer periods." So what does that mean in practice? What you eat, how much, and how often is crucial. The Kuna Indians appear to consume around 1880mg of the critical chemicals each day, while 100g of dark chocolate contains just 170mg. In other words, it looks like you'd need to eat large amounts of dark chocolate (and cocoa) to make a significant difference to blood pressure. Other studies suggest benefits from eating chocolate in smaller quantities. A 2011 review by Buitrago-Lopez et al, published in the British Medical Journal, found "The highest levels of chocolate consumption were associated with a 37% reduction in cardiovascular disease... and a 29% reduction in stroke..." Evidence of reduced stroke risk has been found by other researchers too. A 2017 study of over 80,000 Japanese by Dong et al found "chocolate consumption was associated with a significant lower risk of stroke in women," though there was no significant risk reduction in men (and the researchers couldn't rule out other confounding factors as explanations). All told, then, the science of chocolate is far from clear, but this much seems probable: eating moderate amounts of chocolate does you no harm and might even do you some good, while eating too much sugar and fat obviously does you harm (no surprise there because, as Stephen Fry famously said, that's what "too much" means). Just make sure you get out your toothbrush afterwards! Photo: Now you know: there are good scientific reasons for making chocolate deserts! Photo by Kiona Miller courtesy of US Navy. 1400–1100BCE: Cacao first cultivated in Central America and Mexico. The Ancient Aztecs gradually discovered they could turn cacao beans into a delicious drink. 16th century CE: Explorers from Europe took the beans back to their home countries. 18th century: The famous Italian lover Giacomo Casanova (1725–1798) used chocolate as an aphrodisiac. 19th century: The chocolate molding process was invented. 1825: Dutchman Coenraad Johannes van Houten (1801–1887) perfected the art of making cocoa butter and powder from cacao beans. 1875: Swiss chocolate maker Daniel Peter (1836–1919) invented the method of making milk chocolate. 1880s: Swiss chocolate maker Rodolphe Lindt perfected a way of making smoother-tasting chocolate using more cocoa butter. Adventures with Chocolate by Paul A. Young. Kyle Cathie, 2012. A selection of 80 mouth-watering recipes for chocaholics. Willie's Chocolate Bible by Willie Harcourt-Cooze. Hodder & Stoughton, 2010. Another beautifully illustrated chocolate recipe book. The Art of the Chocolatier: From Classic Confections to Sensational Showpieces by Ewald Notter. John Wiley & Sons, 2011. 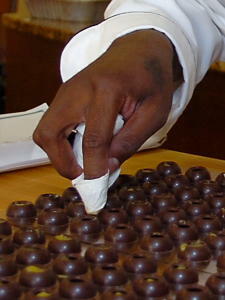 Covers everything from basic chocolate making to entering confectionery competitions. What Einstein Told His Cook: Kitchen Science Explained by Robert L. Wolke. W.W. Norton & Company, 2010. Wolke, Emeritus Professor of Chemistry at the University of Pittsburgh, whips us through answers to all kinds of questions, from how microwaves work to why pasteurization preserves food. Chapter 1 "Sweet Talk", covers a little bit of chocolate science, including why it melts in the mouth (because the fat it's made from has a melting point just below body temperature). Chocolate Can Boost Your Workout. Really. by Gretchen Reynolds. The New York Times, March 23, 2016. A controlled experiment with cyclists showed a slight performance gain from eating small amounts of dark chocolate, rich in a chemical called epicatechin. More evidence that chocolate may be good for the heart, say researchers by Charlotte Pritchard. The Guardian, 16 June 2015. There seems to be a link between chocolate consumption and reduced risk of heart attacks and strokes, but that doesn't necessarily prove that the chocolate is directly responsible. Is Cocoa the Brain Drug of the Future? by Daisy Yuhas. Scientific American, March 1, 2013. Does chocolate make you clever? by Charlotte Pritchard. BBC News, 18 November 2012. Is there a link between eating chocolate and winning a Nobel Prize? 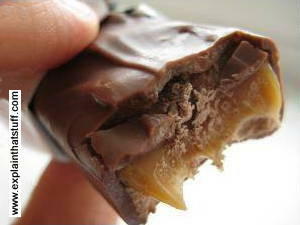 Chocolate may protect the brain from stroke: BBC News, 29 August 2012. The Science of Chocolate: Celebrating cocoa and chocolate's potential health benefits: A summary of a recent American Chemical Society (ACS) about chocolate, 29 March 2012. Contains an interesting list of recent choc-science findings. Chocolate may protect the brain and heart: BBC News, 30 August 2011. Katz, D. L., Doughty, K., & Ali, A. (2011). Cocoa and Chocolate in Human Health and Disease. Antioxidants & Redox Signaling, 15(10), 2779–2811. http://doi.org/10.1089/ars.2010.3697. This review of the scientific literature concludes "that the benefits of moderate cocoa or dark chocolate consumption likely outweigh the risks."